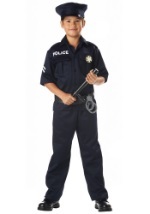 Your child can catch all of the crooks in this Deluxe Police Officer Costume For Kids! 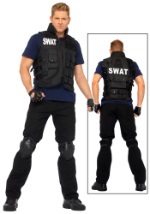 The costume features a long-sleeved navy blue woven polyester poplin shirt with Velcro™ strip closures at center front and decorative brass-tone buttons on the outside. 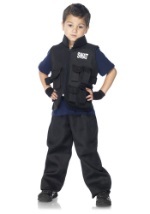 Each sleeve has an embroidered patch that reads "Police Department City of Toyland." 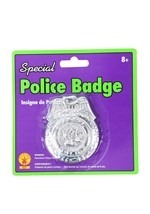 A badge and police patch are embroidered on the left chest above one of the two front pockets which have brass-tone button closures. Each shoulder has an epaulet with three embroidered white stars and a brass-tone button. The word "POLICE" is screenprinted in large white block letters in the back. 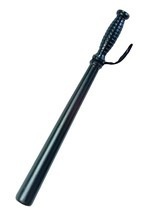 The included police whistle is on a black cord that can be worn as a lanyard. The matching navy poly poplin pants have an elastic waistband. 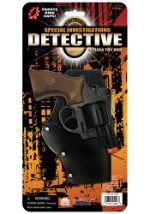 A faux leather police belt with an adjustable brass-tone metal buckle fits around the waist and a matching gun holster slides onto the belt. The police hat adds the final piece to this look! 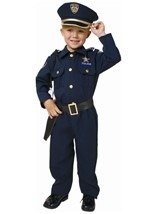 It features a faux leather brim with gold lamé ribbon trim, plastic framing to help it keep its shape, a Velcro™ size-adjustment tab in back and a police emblem embroidered on the front. A gun, police baton and sunglasses to make great accessories.